The Ally CashBack Visa Signature card is finally in my hands! If you don’t know what that is then read on for more details. I received an invitation in the mail to apply for the card. I was not really in the market for a new credit card but it did have a great sign up bonus that caught my attention. 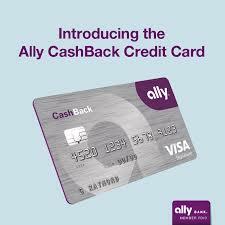 I love cash back credit cards and the Ally CashBack Visa Signature card is good for what it offers. The best part of this card is the sign up bonus. When you spend $500 during the first three billing cycles you earn $100 as a bonus. I usually use one credit card for a month or so and then switch to a new one the following month. When I received this card in the mail I immediately made it the card of the month. I activated, signed it, and switched it out with the card that was currently in my wallet. It will be easy for me to spend the $500 over the next three billing cycles. The billing cycles are approximately one month so that will be about three months of spending. I will use this card as the main card for all purchases until the end of December. I will update you again once the three cycles are over. Since I have other cards that offer 5% cash back, I am not sure what I will do with the card after that since I . Have you gotten a good credit card offer in the mail recently? Let us know in the comments!